A simple and clean AeroWeather version for your Mac. Shows METAR and TAF in the well known AeroWeather layout from iPhone and iPad. 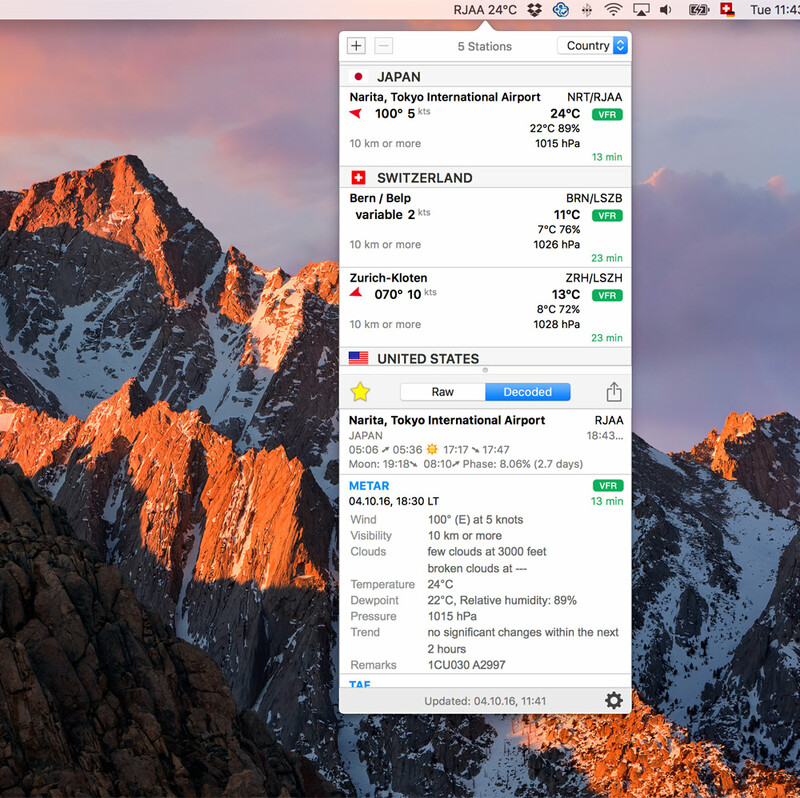 Quickly access your favorite airport weather on your Mac. Requires macOS 10.11 (El Capitan) or higher. Apdated to macOS Mojave. Sharing of METAR/TAF via E-Mail (raw and decoded), Twitter, Facebook, Messages etc. * for backup files from iOS only the first group will be imported. A group from iOS can either replace the existing list or be append to the existing list. > How to add stations? Click on the + button (top left). Select one or many station(s) in the airport browser and drag them in the station list (upper part of the window). It’s also possible to add an airport by double-clicking it. > How to remove stations from the list? Select one or multiple stations and click on the – button (top left). > The menu bar doesn’t show any weather data. Make sure you have set a station as favorite by clicking on the “star” button (right above the detail view on the left side) and that in settings the appropriate menu bar style is selected. > How set/change the station in the today widget? Set a favorite station as described above (star button). Currently only one station can be shown in the today widget. 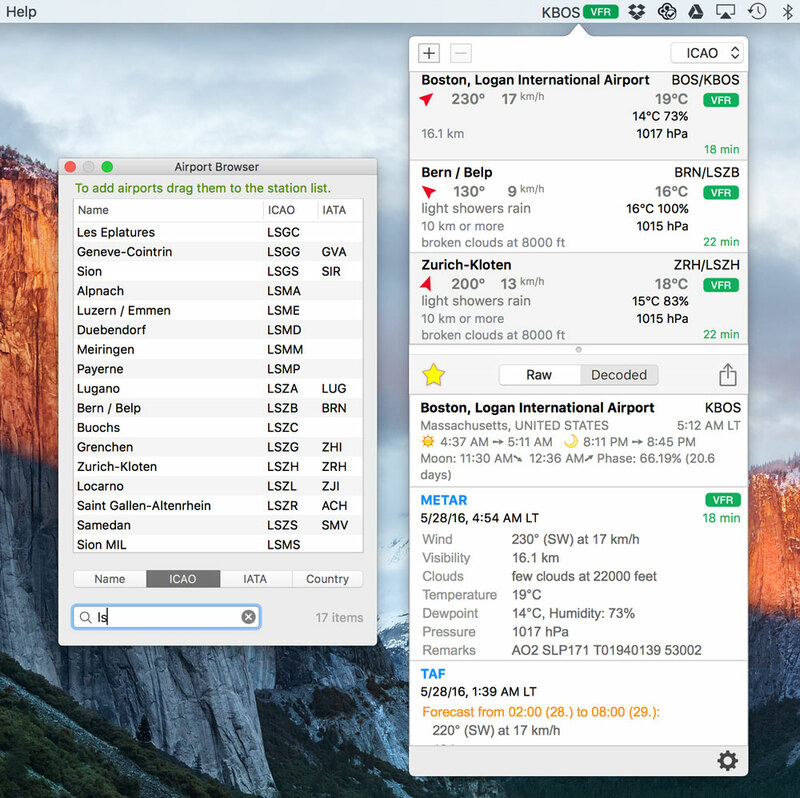 The widget uses the same airport as is shown in the menu bar. The today widget runs independently of the AeroWeather app. The app does not have to be open in order to use the widget. > Why are not all features from AeroWeather on iOS implemented? Due to the nature of the app (menu bar app) space is limited. However, more features will be added in future updates. > How often are METAR/TAF updated? Data is updated every ten minutes. You can manually update any time with refresh button (bottom left button). > Can I transfer my stations from the iOS version of AeroWeather? Yes, this is possible. The entire list can be exported as a group to iOS AeroWeather Pro. For backup files from iOS AeroWeather Pro only the first group will be imported. A group from iOS can either replace the existing list or be append to the existing list. Import/Export can also be used to just make a backup on the Mac version.